Location: Norris Aquatic Center, 13275 Livingston Rd. Awards: Ribbons and medals will be to each teams coaches a day or two after the meet, not after each race like the regular season dual meets. Medals will be distributed to 1st- 8th for individual events and ribbons will be distributed to 1st-8th for relays. Swimmers who do not receive a place ribbon will receive a participation award. Scoring: Top 16 places score, based on time. Psych Sheet: This is the ranking of swimmers by time in each event. This is not a heat sheet and does not provide heat/lane information. The heat sheet will be available on Saturday to coaches and parents. Volunteers: This meet will need quite a few volunteers. Lanes are assigned for warm up and each team has a ‘home base’. Clerk of Course: This meet will use a ‘Clerk of Course’ system. Swimmers will be called to the Clerk of Course tent at least 3 events prior to their next entered event. At the Clerk of Course, each heat will be assembled and will be escorted to their lanes. Parents will not be allowed in the Clerk of Course area. Superhero or Royalty-themed apparel – dress up and have some fun! This was the last week of dual meets before the championship meet and it brought some fast swimming. The Monterey MonteRays (3-1) beat the Ave Angels (3-1) at the Norris Aquatic Center. At the Naples YMCA, the YMCA Krakens (0-4) beat the Sanchez-Casal Gators (0-4) for their first win of the season. At River Park, the River Park Racing Roosters (2-2) lost in a tight meet the Norris Tiger Sharks (4-0). The Monterey MonteRays (2-1) welcomed the Naples YMCA Krakens (0-3) to the Norris Aquatic Center this weekend. The MonteRays came out in full force to come back from a tough loss last week and took the when to advance to 3-1. The River Park Racing Roosters (1-2) traveled to the beautiful Sanchez-Casal Bath and Tennis Club to race the Sanchez-Casal Gators (0-3). The Gators put up some fast swimming but it wasn’t enough to beat the Roosters. The Norris Tiger Sharks (3-0) traveled out to Ave Maria to race the Ave Angels (3-0). After calling the meet after breaststroke due to the heat and how long the meet was, the Tiger Sharks went home with smiles on their faces from a win. With just one more meet until the championship meet, all the teams are having some very fast swims! Week 3 brought a 4th of July weekend with a lot of fast racing. This week brought the Monterey MonteRays (2-0) against the Norris Tiger Sharks (2-0). As always this meet brought many close races and some loud cheering; at the end, the Tiger Sharks came out on top for the victory. At the River Park Aquatic Center, the Racing Roosters (0-2) welcomed the YMCA Krakens (0-2). Both teams swam fast, but ultimately the Roosters swam faster than the Krakens and won. The Sanchez-Casal Gators (0-2) welcomes the Ave Angels (2-0). The Ave Angels came out in full force and took the victory. On June 24th we welcomed some a hot summer day in Collier County. The blazing heat brought some blazing times to the Ave Maria Water Park, the Norris Aquatic Center, and the Naples YMCA! Out in Ave Maria the River Park Racing Roosters (0-1) battled the Ave Angels (1-0). At the end, the Ave Angels prevailed over the Roosters for their second win of the season. The Sanchez-Casal Gators (0-1) traveled to the Norris Aquatic Center for the second time this season, this time against the Monterey MonteRays (1-0). The MonteRays won the meet with a score of 278. The Naples YMCA Krakens (0-1) welcomed the Norris Tiger Sharks (1-0) for their first home meet of the year. The Tiger Sharks pulled ahead early to keep the win. 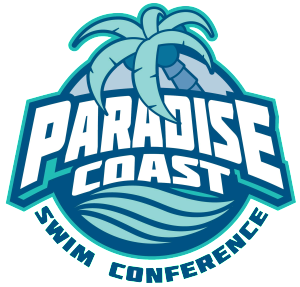 The Summer 2017 Season for Paradise Coast is underway! In a great first weekend of racing, the Sanchez-Casal Gators traveled to Norris Aquatic Center to battle the Tiger Sharks. After a couple hours of fast swimming, the Tiger Sharks came out on top. The Ave Angels welcomed the Naples YMCA Krakens for the first week. The Ave Angels ended up soaring past the Krakens to take the win. The Roosters welcomed the MonteRays to River Park over the weekend. In what was one of the closest meets in Conference history the MonteRays ended up with a victory for week one. The Norris Tiger Sharks win the 2016 Paradise Coast Swim Conference championship meet in a Olympic-themed event on Saturday, August 6, 2016. We hope that everyone had an amazing time and enjoyed their experiences throughout this season. The 2016 season is complete. Get ready…the 2017 season will feature more teams, more competition, and more fun… stay tuned! Awards: Ribbons will be distributed at the END of the meet, not after each race like the regular season dual meets. Medals will be distributed to 1st- 3rd. Place ribbons will be distributed to 4th-8th place. Swimmers who do not receive a place ribbon will receive a participation award. Volunteers: This meet will need quite a few volunteers. Lanes are assigned for warm up and each team has a ‘home base’. Click here for volunteer information, warm up info, and facility information. Olympic-themed apparel – dress up and have some fun! In the final weekend of dual meets of the 2016 season, the Tiger Sharks (5-0) defeated the Racing Roosters (2-3), while the MonteRays (4-1) defeated the Alligators (0-5) .Out in Ave Maria, the Angels (3-2) won against the Krakens (1-4).